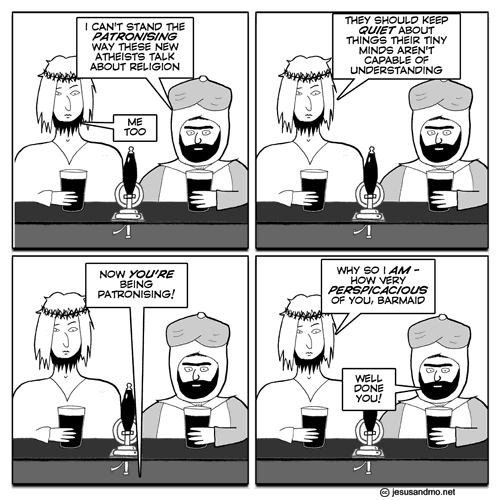 Much to my surprise, Jesus & Mo won the Riffy Award this year. Many thanks to everyone who voted. You’re the best readers ever. Is this piece of satire too? Hilarious! I prayed you’d win, Author. I prayed to a stain on a cardboard box that bore an uncanny resemblance to a levitating, anthropomorphic, plate of cooked pasta. Just shows you what the power of prayer can achieve, eh? Wait – barmaid got a concession? They didn’t resist their own message? I feel a little unsteady. No, well done, YOU [author]! Congrats!!! and well done, voters… take that, Dilbert. At the risk of denigrating the accolade, I gotta’ point out that the runner up, “xkcd” consists largely of [lame] classroom doodles on graph paper…?. …Consider it a sign that the award probably won’t result in a fatwa… Cheers! Congrats on the award! This strip is the best. Way to argue like a religious fanatic, steal your opponents winning tactics. But the concept is sort of clear. I would be interested in what you make of it. Congrats author! One thing for sure…there will be no shortage of good new material for you in 2011! “Much to my surprise…”: You underestimate the power of prayer. No religion? No Jesus and Mo?!#*! Hell No! Congratulations on the well-deserved prize! Might I recommend a cartoon about the ridiculous Baroness Warsi at some point? Utterly utterly brilliant, author! To come top is simply brilliant. 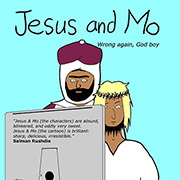 Jesus’n’Mo will become internationally famous, like Google, and Scotland will become a very dangerous place. I take some pride in speaking patronisingly of believers. That’s what happens when all the evidence is on our side. Jesus must not have full access to that omniscient skill His Dad is claimed to have. It’s almost as if he were nothing more than a prophet, just as Mo claimed, back in the day. Congratulations, author! You leave the God-bothering tediousness of WaPo’s “On Faith” column in your dust! Congratulations, Author. I am very pleased as I voted for you and got my godless husband and grandchildren to vote as well. One does not want one’s votes to be wasted. I just clicked on the little man in the red circle in the bottom bar. Very interesting to see where you are being followed, Author. Go forth and spread enlightenment. it’s interesting and exciting how, by tiny steps, things seem to be changing, all thanks to efforts like yours, Author (and lots of other smart people who doesn’t just stay arms folded)…lets keep marching!!! No surprise you’re Scottish. Greatest small country in the world. Nice feather in your cap, Senor Author! Oh, by the by, does the barmaid ever wear a cap? Well, It’s taken me since Xmas to catch up from the first J&M, but it’s been well worth it. Fantastic site, with loads of really witty comments, although sometimes I have to read the strip twice to get it, or find the extra meanings. The comments are also very interesting and instructive, leading me to Google many new words and concepts. Congratulations on a well-earned win – next year I’ll be voting for you as well! @Author – You’re the best readers ever. This particular J and M is a dead ringer for BioLogos. It’s been doing the “you patronizing tiny-minded people” all weekend. I have to agree with Daoloth’s response to keeyop about xkcd. My first impulse in the riffy vote was to vote for xkcd, which IMO is pure genius. @ Stan: Jesus is being played by a white guy.